And not a Rhett in sight! Today saw Britain facing some very windy weather but it was so, so lovely out there today. Beautiful blue skies, bright sunshine – who could resist a wee run out? Certainly not me! I’d not run since Wednesday and was aching to get outside. Early darkness has really curtailed my outdoor evening running and really the only option I have is to run on the treadmill if I’m going to run at all. When I saw the sunshine this morning I knew that I had to get out there! I started with a gentle slope out of the village, followed immediately by a reasonable climb. As I ran down the other side of the hill I was already thinking about the run back up it at the end! The route took me along the main road for about half a mile or so and down a very dilapidated road leading to the shore and the farms along it. My idea was to do an out and back run, turning at 3 miles. I hadn’t eaten before I set off, although I did take Lucozade with me to drink and discovered two VeggieBears in my drink pocket. Ya dancer! My legs were a wee bit wobbly to begin with, but I think I just needed to get into my stride as per usual. As I ran along the Moss Road I realised I was hitting an average 10 min/mile pace. I’ve made a point of only checking my pace on my walk breaks as I was starting to become a bit compulsive about it. Luckily I can stop myself; my self-control is stronger than my compulsion. And then I realised that I had the wind on my back. As I turned to check how strong the wind was, knowing that the turn around was fast approaching, I was hit by a wall of wind! 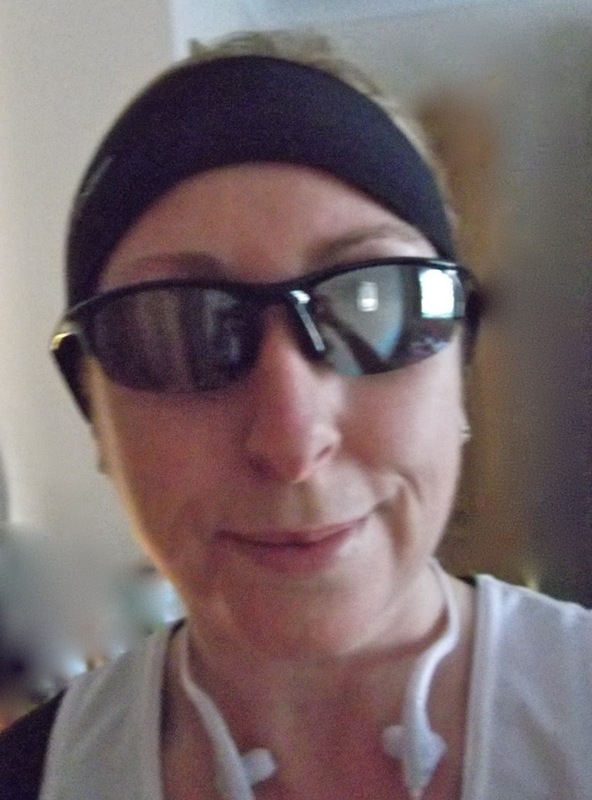 My lovely 10 min/mile pace was mince – there was no way I could maintain that against the wind blowing into my face. I was disappointed; breaking the 60 minute 10k is not impossible, just not possible today. Right enough, on the turn around, I struggled. It was hard enough walking against the wind, running into it was like running through treacle. I did the best I could and just kept telling myself that the more I ran the quicker I’d get to the corner and under a little bit of shelter. 5k came in 31:23. Regardless of the shelter of the trees to my left the wind was funnelling down the road, still hitting me in the face. As I checked my time I had a Garmin moment and managed to restart my watch. Luckily I had started at the no limits sign at the end of the village and turned on exactly 3 miles, so I knew that once I reached the speed sign I’d done my 6 miles. Job done. Turning back onto the main road I was again facing the wind. Ruthwell Church was emptying and so I was waved at by some well-jollied up parishioners as I headed towards the final hill. The hill was tough, but I kept talking myself up it “Come on, come on, you can do it, come on.” A cyclist gave me more encouragement as she free-wheeled down the hill (I’ve found that the camaraderie between other “athletes”, be they runners or cyclists, is fabulous; very few just ignore you, most say hello or wave or shout an encouragement. I guess we’re all part of that club.) All I could think was I wonder if she’ll be cycling back up it and was she thinking God, that’s hard – that woman is really struggling against the wind! Truth is I wasn’t really struggling against the wind. I was in determined mode and desperate to reach the hilltop. When I did I crossed the road and used the footpath, ignoring the bell signalling my walk break as I could not only see the end in sight, but I was also running downhill. Why walk? So, what next? That’s my half training complete. I can run a reasonable 13.1 miles and I am in the process of signing up for the Great North Run 2012, which I will properly train up for. In the meantime I’d like to get my 5k consistently under 30 minutes and my 10k under 60. And also get this belly under control!! Not a big ask then! I haven’t run for over a week and it showed today when I got on the treadmill. A weekend away and a week of not really feeling up to running for various reasons had taken its toll and today’s run was a bit like running in treacle! I’ve been busy today and so by the time I was able to run the light had gone and I was left with no alternative but to run on the treadmill. I don’t mind running on the mill really, but it is boring – of that there is no doubt. And as Trevor is an old-fashioned kind of a guy he hasn’t got gym quality TV or radio, just a static display of distance, time, laps and calories. Listening to my running tunes sometimes isn’t quite enough. Last Sunday I should have run 5 miles; today I should have run between 6 and 8, all according to my half-marathon training schedule. So I’ve decided to pretend that last week didn’t happen. I could run 5 miles today and next week, when I’ve had two more short runs in the week, I can happily do 6, 7 or 8 miles. That’s the plan. Don’t shoot me if it goes to pot – things have a habit of not quite going to plan around here! I started steadily and forgot all about my walk breaks, just happy to run. It wasn’t until I’d done 2 km that I decided to walk and have a drink. I carried on this way right through, taking my walk breaks just when I needed them rather than on the ding of a bell. I was a bit disappointed to see my 5k time was 34 minutes. That’s really slow for me, even on a longer run. I felt dizzy and tired and my legs were sluggish; I guess I was just going through the motions today. I hit 8km in 54:37. Nowt startling, but another 5 miles under my belt bring my annual tally up to 412 miles. It would be nice to hit 500 by the New Year. So that’s me for today. I’ve just had a lovely shower and I’m presently multi-tasking by, beside typing this, also cooking a Thai QuornYellow Curry with brown rice noodles and will shortly be sitting down with a small glass of red wine and will watch a movie. As a post script to my last post I am currently wading through these workouts courtesy of Women’s Running magazine (UK). My idea is to print the ones I want out on A3 sized paper and staple them to my gym wall. On Friday I wrote a blindingly good blog about my run on Friday morning on my phone whilst being driven down south. It was a wonderful essay on the delights of running surrounded by nature and all about how one should be taking the time to stop and look and soak it in, rather than race around the world with a head filled with times and pace. I was so pleased with it. I guess it was also a metaphor for life, which is ironic really, because I lost the blog between writing it and posting it. Damn you 3G reception. Today I’m off work with an ongoing issue that hopefully tomorrow will be sorted out by a visit to the out-patients department of Dumfries Infirmary. Nothing terrible, just a minor thing that will have a major effect on the quality of my life. In the meantime I haven’t been running since Friday morning’s gorgeous trail run. And I haven’t really missed it either. I can’t run at the moment; I may be able to by Thursday. My Facebook friend Connie has been very inspirational, not just to me but to many women who are overweight and wanting to do something about it. Connie has halved her weight and is a great runner, far faster and stronger than me (although granted she has been running for longer). She is working her fat into muscle, disregarding the scales. I know that my core strength is my big weakness and I really need to work my body harder to make that improvement. 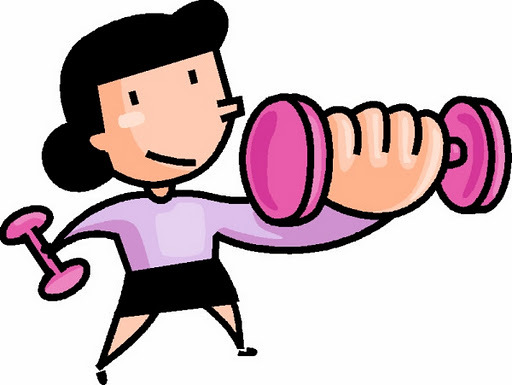 So although today isn’t the day to start, I am working out my work out programme! I know that I need to work out a series of repetitions of a series of exercises. I need to start small and work it up. I recently signed up for Plank-a-Day on Twitter and, yes it’s a great idea, but I tried to start with a 60 second plank when I should have started with a 30 second one and maybe did that for a month before moving up! I have to make this achievable to make it work. I also need to look at my entire core, not just my abdominals. When it’s done I shall print out big posters for the gym wall and I will follow my regime religiously, because I’m like that. Once I’ve decided on a course of action I do stick to it. Unique Races for Unique Runners INC.
Once all my duties were complete I also needed to drive the route I’d picked on the computer. I had had to choose roads I didn’t know at all, despite having lived here for five years and checking that they were at least passable was only sensible. Driving the route also gave me an idea of elevation changes and in doing so I soon realised that running it clockwise wasn’t the best idea I’d had. At one part there was what I can only describe as a huge staircase, a steep climb followed by a steep climb – you get the idea. Reversing the course still left me with climbs, but they were steadier. One more problem emerged though – the odometer on the car was showing seriously shorter mileage than what the computer was telling me and because I’d overlapped the route in places I was struggling to see where I’d missed out a mile or so. Such was my excitement I forgot to check this before heading out. Such was my excitement I also forgot to take my watch!! I had decided to run in my Alzheimer’s tech vest because raising money for this worthy cause has been part of the reason why I am doing these crazy things. My target of raising £300 this year, one pound for every mile I challenged myself to run in 2011, is nearly complete. I’ve long since passed the mileage total and I have less than a tenner to go to reach the poundage total! I would like to thank every one of the sponsors who have donated their hard earned, many of them outside of Scotland but who can appreciate the importance of the cause. Once I had everything I needed I headed down to the gates of Comlongon Castle, my starting point. Once ready, I hit the start button and my race had begun. My route took me through the village and up in a loop past Ruthwell Church before heading down towards Ruthwell village. In point of fact I think that was my first mistake. I think I should have run past the church and carried on under the railway line before turning right to join the main road again. I mistakenly thought that the map was showing all the roads, but it quite obviously doesn’t. I didn’t want to go out too fast and be left with nothing at the end and I was determined to do the entire distance with my prescribed run:walk intervals i.e. no stopping to walk on a run interval. My race pace was around 11 minute mile average. I know that I can average faster, but this was my first time. Crazy yes, daft no. I was running in cool late autumn sunshine and it was incredibly pleasant! The sea mists were rolling in gently, keeping the temperatures down which suited me perfectly. Whilst I ran past walkers in coats, hats and gloves out with their dogs I was in short sleeves and gloves and very comfortable. The Roxburghe and Moss Roads were new to me and I almost regret not having at least walked along them before. They are old roads, so worn out now that there is a distinct hump in the middle and two tracks still in tarmac either side. Built on marsh land the road has sunk, but it is straight and flat and lovely to run on. I was able to pick up some pace and enjoy the view at the same time. Once I reached Cummertrees village there was a sharp climb up to the main road. I knew that I would have to turn onto the road and run along it for a wee while before turning off up towards The Hannah, a farm just across the road. This, I knew, would be the start of my climbing; the hardest bit of the course. 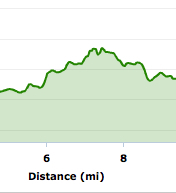 The elevation chart for this section of the route shows you how much I was climbing. I didn’t design this looking for an easy, flat route. I went at this as a race designer looking to test the entrants. However, if you look at the chart from right to left you can see the ‘staircase’ I thought it best to avoid! At mile 7 I decided to take my gel. I had chosen a gel that was a drink as well and didn’t need to be washed down with water. I chose Maxifuel Viperactive gel in mixed berries flavour and, once I’d removed the top (! ), I found it much nicer than the last gel I’d chosen. I felt invigorated and more so because I’d reached the top of the hill! And at not one point did I slow to a walk! Unsurprisingly miles 7 and 8 were by far the slowest and that middle section took a lot out me. However, knowing that I was over half way with chiefly down hill and flat sections ahead of me I was happy to run on. Heading back down to where I would normally run I passed the delightfully named Cocklicks Farm. Much like the famous port Cockburns, Cocklicks isn’t apparently pronounced how it looks, and, so I’ve learnt, neither is Twathats which I pass on my loop, but I’m yet to discover quite how to say either without raising at very least an eyebrow! It made me chuckle as I passed by! Once I reached Ruthwell Church for the second time I knew something was up with my mileage. I was a mile and a half out and I couldn’t work out then where to make it up! I ran down through Ruthwell village and joined the Bankend Road. I had no choice but to run along it for a while and double back on myself until I guessed I have about a mile and a half to go. Not easy, but I chose a likely turn point and went for it. As luck would have it I wasn’t far out and at least running on the fairly flat Bankend Road allowed me to claw some time back. As I ran up Grant’s Hill, so named because on out joint runs out Grant hates to finish on this hill, I was surprised at how easy I was finding it; I didn’t have far to go. One mile left. 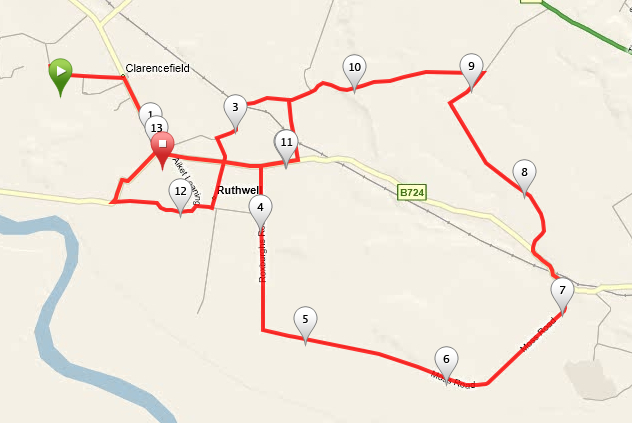 I ran back through Clarencefield, hitting 12.9 at the top of our road! With no where left to run I headed back down the castle road until the magic Garmin turned 13.1 and hit stop! I finished my 13.1 miles to cheering in my head because there was no one around. It didn’t matter though; I had run my race in 2 hours 34 minutes, just 4 minutes over the time I set myself when I started training and a very respectable time for a first-time half marathon on a hilly course. I will beat that, of that I have no doubt. Looking at my planned route and the route I ran I can now see exactly where I went wrong. It’s unfortunate that the planned route had to criss-cross otherwise I wouldn’t have gone wrong at all, but that’s life and I’m not going to worry about it. I will run the route again because it was lovely. Before the race one of my lovely runner friends told me to “Race Pretty.” I’m sorry, I race skank. There is nothing pretty about me when I run before, during or after. I am only prettier after my deep bubbly bath and when the blood has drained from my big, red face! I’m not being harsh, just realistic – this is me and I’m happy. I am, after all, a half-marathoner. When I set myself the challenge of training for a half-marathon I didn’t have the good sense to open the diary and look for a half I could do and work back from it. No, not me! I just went for it. Which means, of course, that now that I am ready to do a half I don’t have one to go to. Tomorrow is meant to be my race day and there are two half marathons listed, one in Fort William (4 hours away) and one in Lancaster (just under 2 hours away). I was tempted by going to either one of them (the FW Half had been recommended and it doesn’t start until noon meaning not such an early start and the Lancaster Half starts at 11am) As hubbie is working it would mean me getting myself there and sorted out and I’ve probably left it far too late now anyway. And then I decided, what difference does it make where I run? It’s not as if I’m competing for a prize! The only person I’m competing against is myself. So tomorrow I will be running a half marathon…here in Dumfries: The Julie Hollis Half Marathon 2011. The route is undecided; I’m working on that one. It won’t be my usual loop route though because I’m fast coming to the conclusion that, due to the nature of the topography, this is not a rainy weather route – the road floods all too easily and 13 miles in wet shoes is not fun. It won’t be a flat course because I live in Scotland and, even close to the shore, we have hills! So there we go. I’ll pop into my health store and get my gel and Vegebears this afternoon and tomorrow, after I’ve put the washing out to dry, I’ll start my first half marathon race! I might even get myself a medal to win from the trophy shop! Who says running isn’t fun? Learning to check labels or end up paying the price! Since finding out that I am gluten intolerant I’ve had to become more careful choosing what foods I eat. At the very least eating gluten-laced products can leave me feeling exhausted; at worse I become hugely bloated and nauseous. Yesterday I spent all day researching gluten-free cake mixtures and ended up making some lovely cakes that my whole family are enjoying. 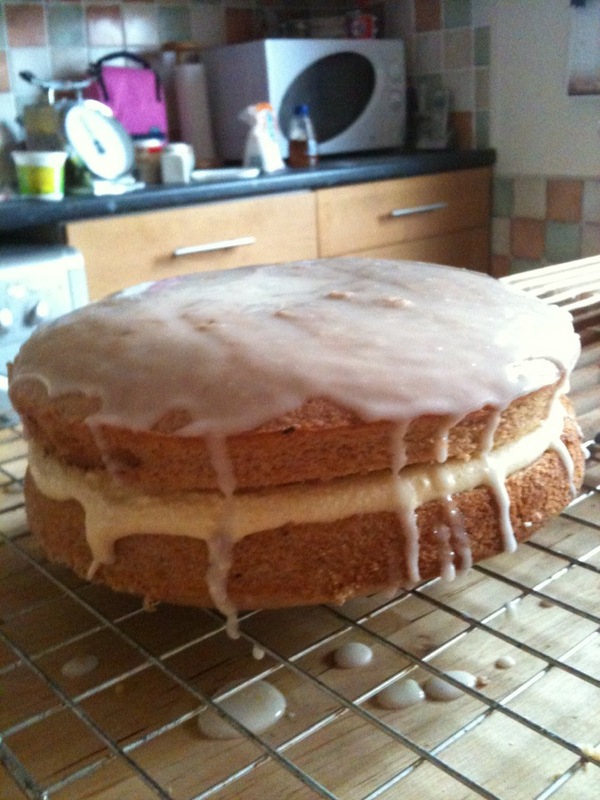 I used spelt flour, which is not gluten free, but has a far lower gluten level than wheat. Any GF flour can be used. • Beat eggs with sugar using an electric mixer. • Add melted butter, flour, baking powder, and sour cream. 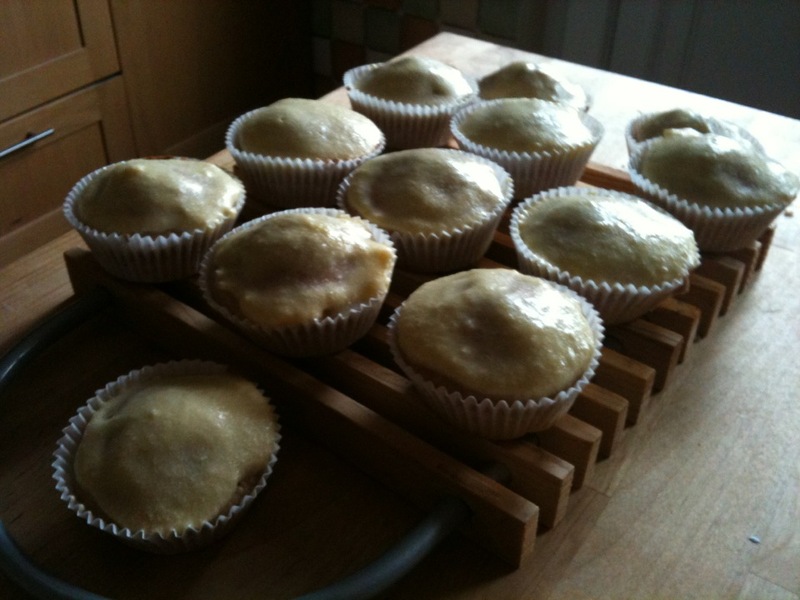 I used this recipe to fill 24 bun cases and 2 sponge tins. 12 of the 24 iced buns I also made! Last night though, after dancing practice, I treated myself to a packet of crisps (US=chips). I didn’t check the label, not realising that not all crisps are gluten free. Straight away I felt ill. On checking I found that I’d chosen the packet with gluten in! So from now on I just need to be more stringent!